Hildegard of Bingen, the renowned twelfth-century theologian, composer, poet and mystic, continues to inspire and excite people. In 2018, KU Leuven is showcasing her life and work in an exhibition, conference and concert. The exhibition at the Maurits Sabbe Library presents a unique selection of manuscripts and early prints of Hildegard’s work, including some of her letters. 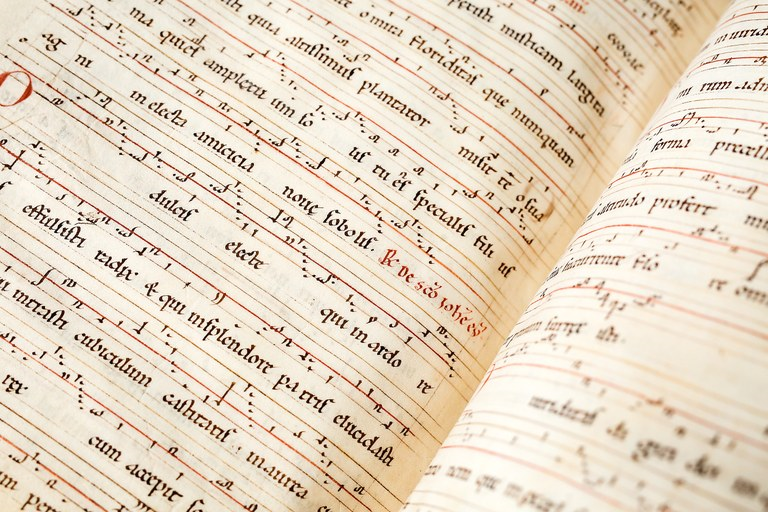 The highlight of the exhibition is the Dendermonde Codex, a manuscript comprising a remarkable selection of texts and songs, including the Symphonia Harmoniae Caelestium Revelationum. Hildegard of Bingen wrote the Symphonia in the middle of the twelfth century at the Abbey of Rupertsberg, in the Rhineland. The manuscript contains fifty-seven monophonic hymns for liturgical use. In addition, the codex contains Hildegard’s Liber vitae meritorum (The Book of the Merits of Life) and the Liber viarum Dei (The Book of the Ways of God) by her friend Elisabeth of Schönau. The manuscript closes with a dialogue between a priest and the devil, a text that has rarely been researched. The codex has an eventful history. Circa 1174, Hildegard sent the manuscript to a monk at the Cistercian Abbey of Villers in Brabant. It was later moved to the Abbey of Gembloux and then to the Abbey of Affligem, before finally finding a home at the Abbey of Saints Peter and Paul in Dendermonde in the nineteenth century. In 2017, the monks of Dendermonde decided to give the manuscript – which is now officially recognized as a Flemish Masterpiece – to the Maurits Sabbe Library at the Faculty of Theology and Religious Studies, KU Leuven. The focus exhibition will run from 30 May until 22 August 2018, and is being organized in the framework of the international conference Medieval Mystical Theology in Dialogue with Contemporary Thought. In addition to the Dendermonde Codex, which is also being digitalized for viewing on a touch screen, the exhibition will feature early prints of Hildegard’s work and the texts of a number of other medieval mystics. On Thursday 31 May, the opening of the exhibition is also being celebrated with a concert of excerpts from Hildegard’s Symphonia by Psallentes, a Leuven-based ensemble specialized in medieval and Renaissance music. The exhibition is a collaboration between the Faculty of Theology and Religious Studies, the Book Heritage Lab and the Abbey of Saints Peter and Paul, Dendermonde.